Glenn Beck has come out with a big sob story (he's so good at the sob routine) about his health and how doctors have helped turn him around. Of course, he gives credit to God for his strength and recovery, but Beck might have it backward. Beck believes God gave him strength to survive, but what if God was punishing Glenn Beck for his many cruel behaviors, lies and moral shortcomings (like his serial hypocrisy)? Maybe God was sending Beck a message because of his call to have climate scientists "commit suicide" and/or thinking out loud of "chocking the life out of" Michael Moore. That's the thing about God; It can be interpreted many different ways. God, for example, could be a He or a She or an It. 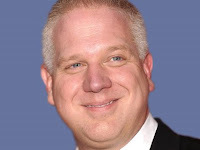 Maybe there is no God, and Glenn Beck just became ill from burning the candle from both ends for many years. Maybe his illness, if he's not just lying about it, is well-deserved, bad karma. This reactionary propagandist is still a liar misinforming people. Update, 11/14/14: As written above, Beck is a serial hypocrite. After disclosing this supposed illness and cures this week, some medical experts came out and claimed that Beck's cures were "pseudo-scientific quackery." Beck turned to Facebook to write that he couldn't believe people could be so "nasty" as to claim his medical issues were fake.